Hi, and Welcome to AZ Pet Stylist!! 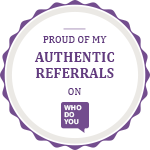 We are so glad you are taking a moment to check us out! As pet professionals we find that an educated owner makes for a happier, healthier pet henceforth we are providing you with this brief tidbit of information on what we do and things you may be able to do to help Fido be all that he/she can be. 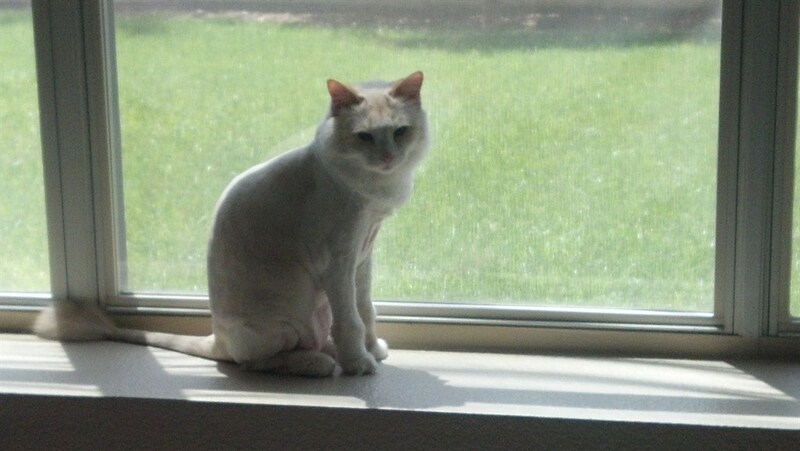 We are a full service mobile pet groomer serving the Southeast Valley. All of our services for dogs include: Blueberry facial, teeth gel, nail trimming and filing, ear cleaning with the option of plucking, bath, shed-less treatment, blow dry, and brush out as well as any necessary skin and coat therapy. The only difference between a Full Groom and a Bath and Tidy is the haircut on the body. Bath and Tidy’s still include sanitary, feet, and face trimming. We do provide just nail trimming or nail trimming with ear cleaning and/or gland expression if a full grooming service is not desired. Our units are fully equipped and self contained with air conditioning, hot water heaters, hydraulic tables, and so much more to make sure your fur babies get the best treatment. Some of our units do have the option to open the sides to create more air flow and a more open atmosphere. This option is not available during the summer while the A/C is in use or with those animals considered to be more flighty, especially cats. We always consider the needs of the animal first. Unfortunately we do not allow pet parents in the mobile units during the grooming process. However we absolutely welcome you to come check on them at anytime. We work by appointment only and provide one hour windows for arrival for all appointments, with the exception of our 7 am appointment slot. Appointments starting as early as 7 am and can go to as late as between 4:30 and 5:30 pm from Monday through Saturday. Unfortunately, for those multiple pet homes of 2 or more we cannot offer arrival times for too late in the day because of the length of time required to complete the entire appointment. We do tend to remain booked 3-5 weeks in advance so please make sure to call to schedule in advance. However, if you need something sooner we do have a wait list that we can add you to in case we have any last minute cancellations or changes in the schedule. In addition, we provide a few of the same products we use during the grooming process for sale on site if you are interested. Just ask your groomer if you are interested. Our main goal is to have the item on hand that we are recommending such as the proper brush or comb and henceforth eliminating the need for you to remember what we recommended, putting aside the time, and then going to find it or something similar. Besides, who doesn’t like a little extra convenience. Just as everyone says, there’s an app for that, the same is true for your furry family member’s health. The Pet Tech Saver App looks just like this picture on the left. It isn’t free but it only cost a couple of bucks and gives you more than enough information on just about anything dog or cat related. It even has a section to help you quickly find the nearest help if a pet is in trouble. IF you are interested just search for it or you can find it at http://www.pettech.net/. This app is a part of the Pet Tech CPR and First Aid Class that all of our Stylists have become certified in. If you are interested in taking the full class please see our Pet CPR & First Aid tab for more details. To begin, at all of our grooming services we automatically include teeth gel. The reason we include this service free of charge is that we as pet professionals know how important dental health is to our furry family members. Think about it, everything that your pet eats goes through their mouth (obvious enough). This means that whatever so happens to be on their teeth is being ingested along with their food. If the dental hygiene is not what it should be and bacteria is flourishing, then your pet is eating bacteria on a daily basis. This being said, to maintain dental health it is recommended to brush your pet’s teeth as often as you brush your own teeth. Imagine going for just a week without brushing your teeth how horrid your breath might smell and how simply unclean and unhealthy you would feel. Now imagine only having your teeth brushed when the groomer came. 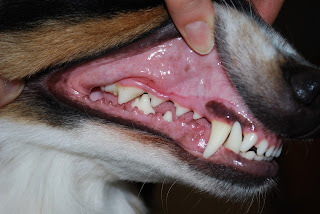 I only have you think of this to realize that yes we do take care of your pup’s teeth when we are providing our grooming services to you but it is not enough to keep your pup’s dental health up. In reality we, as responsible pet owners, should brush their teeth for them on a regular basis and bring them in for dentals just as we take care of our own teeth. 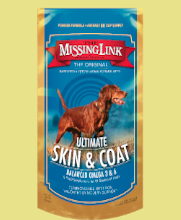 This will not only help decrease bad doggy breath but will make for a much happier, healthier pup. F.Y.I. 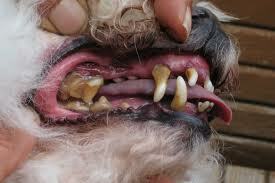 The number ONE leading disease in dogs today is Periodontal disease. 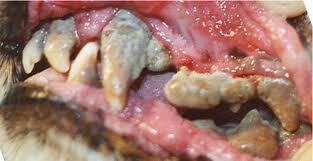 Periodontal diseases are infections of the gums and bone that surround and support the teeth. In its early stage, called gingivitis, the gums can become swollen and red, and they may bleed. In its more serious form, called periodontitis, the gums can pull away from the tooth, bone can be lost, and the teeth may loosen or even fall out. Don't forget the check the teeth in the back. Most often this is how the dental health issues sneak up on us. Plaque build up starts most often just like the picture above, in the back. 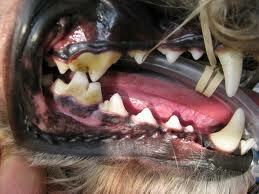 Thus if you do check your pups teeth or brush them, make sure to get back in there. At this point a Dental is a must. Yes, they really can get this bad. As an added measure we include Pawgress Reports at your first visit to keep you up to date on our observations of your pets general visual health. Because we will be seeing Fido’s teeth we want to make sure to let you know what we find. 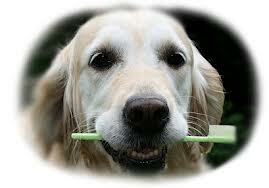 In addition, we provide the same dental product we use to clean your pup’s teeth for purchase on site. For pricing please see the products page.